I get in a rut with pasta. 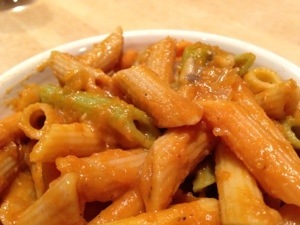 I usually have some kind of tomato sauce with meatballs or roasted veggies. Over and over and over. So I was excited when my friend Meghan offered me some leftovers of her Pampered Chef Harvest Pasta Skillet. It was delicious! Brett ordered pumpkin ravioli at a restaurant once and has been talking about it ever since, so I thought this would be an easy knock-off. This is seriously good! It’s so rich and creamy that I didn’t miss the dairy at all. And it was a big hit with Hannah, though she picked out the mushrooms. I liked that it seemed like a fancy pasta dish without any fancy ingredients. This will be on our table again. Here’s something for everyone stuck in the Midwest blizzard! I’ve mentioned I love my slow cooker. 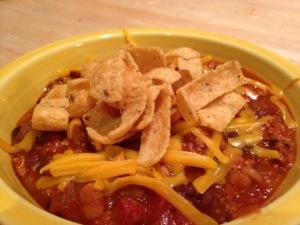 I love to make chili in my slow cooker, and the recipe varies a bit each time depending on what I have on hand. All good, but this batch was so tasty, I knew I had to actually write the recipe down because I definitely want to replicate it. Everything in the slow cooker for 6-8 hrs on low. This is a great “pantry meal” – if you have a well-stocked pantry, everything should be on hand. Handy when there’s a foot of snow outside. The beef was from the freezer from the huge meat delivery we just got. The beans were also from the freezer. I did buy the tomatoes this week for this meal, but when they go on sale I try to stock up, so I often have a stash in the pantry. 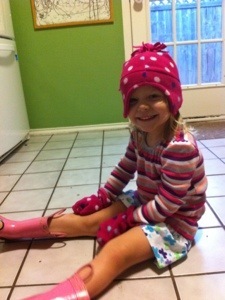 It’s a good thing three-year-olds are funny. It helps balance the careless breaking, tantrums, sassy pants, etc. There are certainly some fun sides to three, and at our house they involve Hannah’s love to talk and her love of clothes. 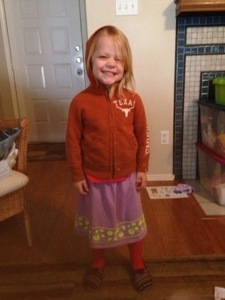 I let her dress herself pretty much every day except Sunday. I try to only step in when there is a weather or modesty-related issue. Like “It’s 40 degrees, you can’t wear shorts outside.” or “Tights are different from pants, you can’t wear them by themselves.” But I don’t think it’s a big deal what matches or doesn’t, or restrict rainboot wearing to actual rainy days (that would be almost never here). Her wardrobe options are fairly easy to put together, so usually it’s not necessarily noticeable that she picked out her own clothes. But sometimes it’s clearly Hannah style. Do I feel a little twinge when the little girl in the cart next to us at the grocery store has cute shoes, coordinated jeans, shirt and cardigan with a matching headband? Yep. But my kid is clean and creative, and today that’s good enough for me. – Violet measured at 15.5 lbs and 24.5 inches at her 4m appointment. She’s been having a little diaper trouble, so…. – I’m off dairy. Cow milk protein sensitivity is not uncommon in babies, so this isn’t anything concerning or necessarily permanent. I’m thankful I have a large recipe repertoire, so eliminating cheesy dishes won’t be too stressful from a cooking perspective. I’m really going to miss cheese and ice cream, but a healthy baby is worth it! But, wow, there is dairy hidden in a lot of products, so I will be doing a lot of label-reading for a while. – We’ve had a string of breakages. The rice cooker, mixer, printer and garage door have all busted in the last two weeks. We are currently down to one car because my van is trapped in the garage. Hopefully, a guy can come fix it tomorrow. *Today at Whole Foods she told me, “That guy has decorated arms!” Tattoos. *We were talking about places we’d like to visit and mentioned the Grand Canyon. We told Hannah it was very far away. “Why?” Because God put it there. “Then he should move it closer.” We told her to take that up with the Big Guy during bedtime prayers. Faith like a mustard seed can move canyons? – At the moment, we’re settling down for the Downton Abbey season finale. We’ve got tea, English muffins and red wine. Bring it on! New menu idea – Monday night is bean night. Beans are a healthy and inexpensive protein, and since I do my grocery shopping on Tuesday, a consistently easy Monday meal will ensure I’ll have something to put on the table. Black beans and rice are an easy go-to meal; add a little cheese and salsa and we’re happy. 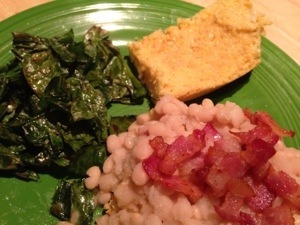 But with inspiration from another blog on Frugal, Real Food Meals, I gave beans and cornbread a shot. This took a further turn toward the Southern when I pulled out the Brussels sprout greens from our CSA basket. Since I use beans frequently, I save money and avoid a little BPA by cooking batches of dried beans in my slow cooker and freezing portions. This time, I threw in a little bacon and onion when cooking the white beans. The Brussels sprout greens were new to me, and I figured I’d sauté them like collard greens or spinach. Fail. They just browned and got crispy, kind of like kale chips. But they were really tasty, reminded us of those crunchy outer leaves when I roast Brussels sprouts. Next on the plate was the cornbread. I used a recipe from the More-with-Less cookbook, and Brett pronounced it his favorite cornbread ever. I cut a large piece in two, then topped one half with the beans as garnished with crispy bacon. The other half I buttered then drizzled with maple syrup. Cornbread sweet and savory. This was delicious. If you think beans are boring and bland, try something like this (bacon! happy!). And if you have any more ideas for my Beany Monday rotation, let me know! 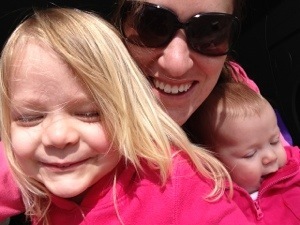 Before Violet was born, we asked Hannah what important things she would teach her baby sister. 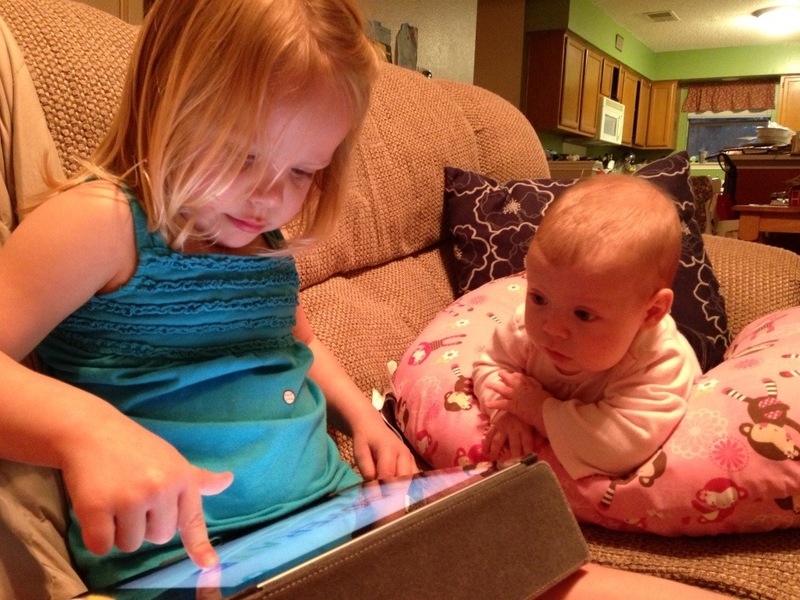 She answered, “How to use the iPad and how to play the piano.” She’s starting early.